Open Edition Marine Prints by Roy Cross. Affordable, large-scale prints by one of the premier 20th-century marine artists. Roy Cross's interest in marine art began when accompanying his father on walks around the London docks, sketching the boats he had seen when returning home. Aged 15, he began to work for a Thameside shipping office. Here he saw Thames barges and the last of the sailing coasters, and thus in the 1930s was born his lasting love of sea and ships. After training at the St. Martins School of Fine Art, Roy Cross's artistic career became established as an illustrator in numerous fields for journals and books. During the Second World War he illustrated air force maintenance books and pilots’ manuals, as well as publications such as 'Aeroplane' and 'Aviation Week'. His detailed drawing of the Gloster Meteor, Britain's first service jet fighter, took him eight weeks to create, was a yard in length, and became acknowledged as a masterpiece of this specialised branch of technical illustration. In addition he exhibited his work at the Society of Aviation Artists, of which he is also a member. After the war, Roy Cross produced illustrations for the tops of the Airfix model boxes which are remembered by generations of children today. However, as an illustrator, he felt restricted by the limiting factors of commercial art and longed for greater freedom of expression. He decided thus to concentrate primarily upon marine painting and he was immediately successful. 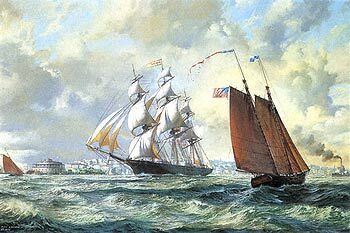 Elected a Member of the Royal Society of Marine Artists in 1977, his art covers clipper ships to Mississippi steamboats, warships to commercial steam vessels and Royal Yachts to Americas Cup contenders. 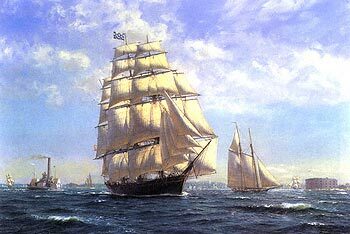 The combination of research, the practical application of this knowledge and the love of his subjects has its rewards, as Roy Cross is considered by many to be the most accurate painter of historical marine vessels of all time.